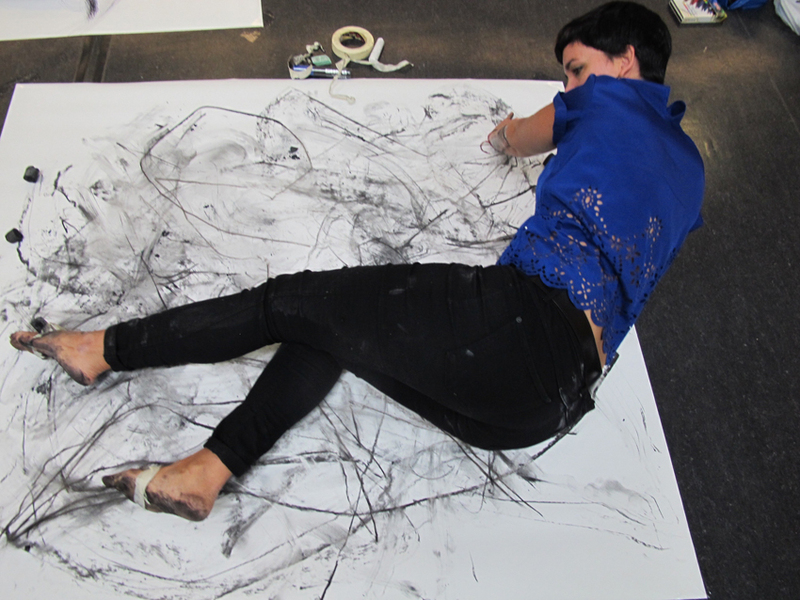 Draw to Perform workshops I attended in December exceeded all my expectations! I was able to step back to my childhood where I was over the moon every time my father bought me a new set of colouring pens and my mother bought me story books with beautiful illustrations. I also swore at the age of 3 it was me who had painted a beautiful bouquet of flowers on my childhood bed. The workshops offered a diversity of approaches facilitated by the lead artists that was generous, full of curiosity and enquiry and experimental allowing me to find connections between what I already knew and what was new for me. As a dancer, I have been looking for a way to bring the awareness of other disciplines into my work, such as sound/voice and drawing. The workshops offered a safe space to try and discuss ideas that can be developed further. I will definitely come back! I attended the workshop on day 2 of the Draw to Perform festival 2018, with Ram Samocha. I’m not an artist and I found the workshop was a great opportunity to experience the interaction between drawing and making sound in a relaxed and inspiring environment. 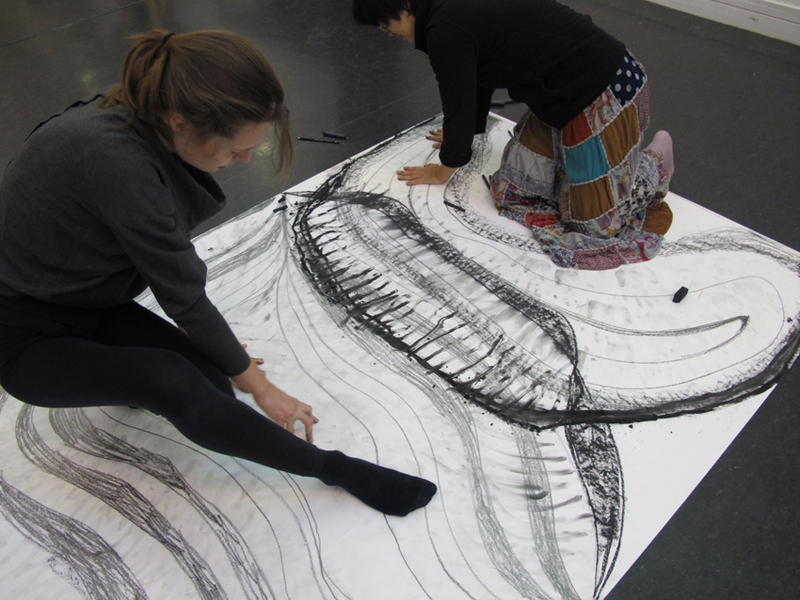 I particularly enjoyed working with the other participants and using our bodies to guide our drawing and sounds. Thanks for this opportunity! Thank you for this lovely workshop. I feel that my mind was gradually liberated throughout the three stages of drawing performance practices. I was easily led to a state of meditation with my performance consciousness work with my ten pieces of drawings. (Though not quite grasped the instruction, I lifted my hand, sorry). The second stage of blackening the piece of paper was very soothing as it liberated my childhood aspiration. And the third stage, the collaborative drawing performance, had opened my mind and liberated my spirit more through the play and playfulness with my fellow performers. Thank you so much for this memorable event and I hope the participate in more workshops exploring drawing and performances in the future. I would like to say a biggest thank you for the opportunity! It’s been an amazing weekend of adsorbing and responding to you and everyone involved. I feel very fortunate to had the chance to participate. The workshop has continue to leave its trace with me. 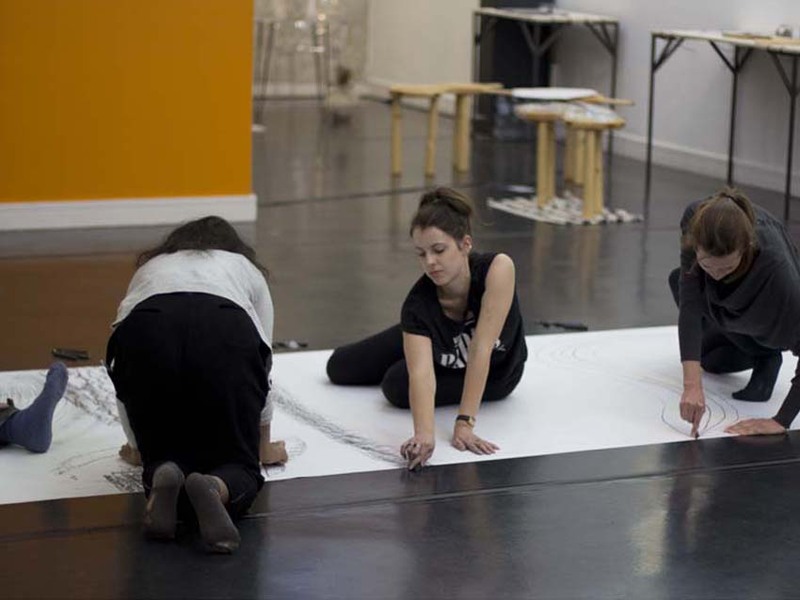 Your work allowed the question to open up the ideas of what is ‘Contemporary’ about the attitudes and process of drawing into something that connects with the current state of being a creator, thinker, maker? I found it interesting each artist whom presented there performance drawing was not the sole catalyst but a by product of their investigation. I found the delivery of your workshop was very beneficial for the development of personal systems and adopted the energy of Day 2 session from your drawing warm up exercise. 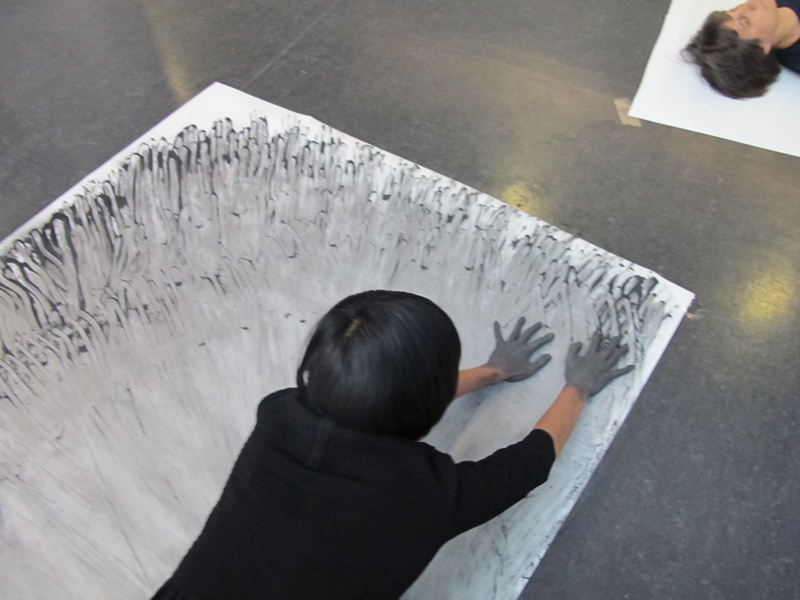 You allow me to move, drag my fingers and stretch whilst drawing! Something I have been trying to understand why I don’t and why I need to as well. Pushing the expression with material and mark. Thank you for such a great symposium and workshop – I found it so inspiring and empowering. 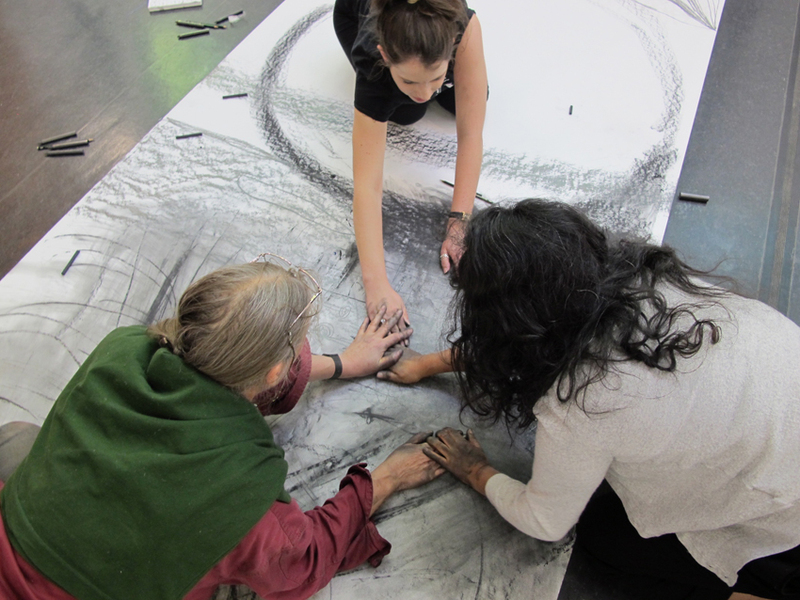 It was really great to take the time to focus on drawing by dissecting it and pulling it apart through the different stages of the workshop and thus realizing the performative aspect. I am deeply appreciative for this opportunity as it opened a few ideas and even resolved a few questions/issues I have been thinking about in my own practice and research. The collaborative aspect was great as it is something I hadn’t really encountered before – I found it liberating! Please do stay in touch – I look forward to following the symposium and the artist’s practices. I would love to attend again in the future! It was a pleasure to participate in your workshop. You are a very good guide and it was revealing all the information about ourselves that marks without thinking can show. All the physical experience was really interesting as well and confirmed that we are one experience with the mark that we are making, the self disappears to become a big instrument of expression as a direct canal from the heart. Thank you for teaching these experiences to the world. The only one I remember that did it was Trisha Brown long time ago. 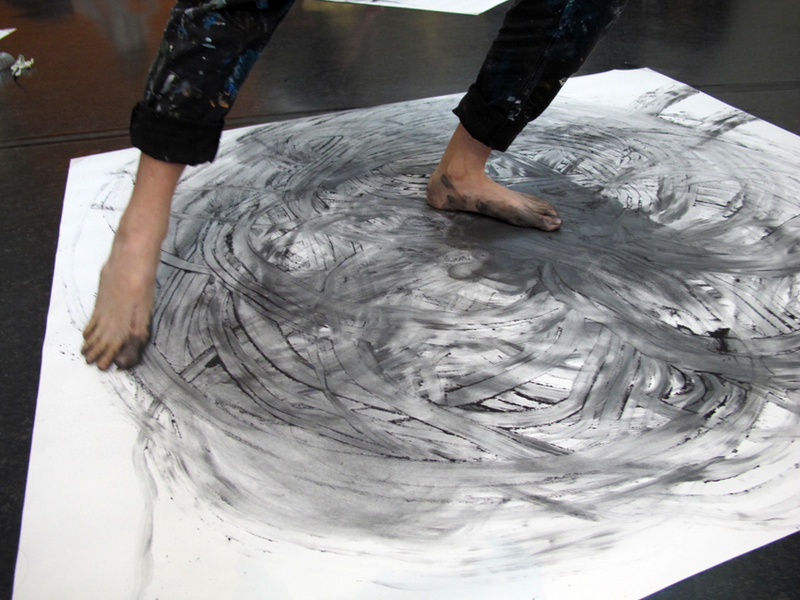 Drawing with my feet was one of the best feelings I had. Everybody should do it. And the self has gone, and you are covered in a material, in a colour, and you don’t care, and you feel so satisfied and there is anywhere else you would like to be rather than there. When I left I had the feeling of deep content, and feeling very relaxed. The workshop was really interesting and inspiring. Ram led the activities, which were clearly structured but also gave us the opportunity to improvise and make our own. Ram promoted discussions during the workshop. It was really interesting to see different people’s views on the activities and approaches to drawing. The final activity was absolutely brilliant as it allowed us to bring all our previous thinking into a performance drawing. Overall I thought it was a brilliant experience and an opportunity to investigate things that had been in my mind for a while in a save environment! Taking part in the Draw to Perform workshop was a great drawing challenge. It moved my ideas on as to what drawing can be. I feel a lot easier about using drawing in a much more experimental way.